Bio: Monxo gives Wolfwire the power to rewind time in short bursts, but it drains his energy to dangerously low levels. 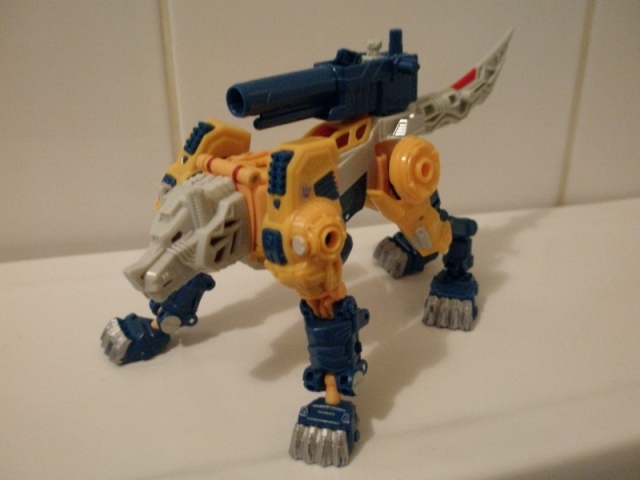 One of my first vintage purchases, the original Weirdwolf toy was something of an unimpressive lump weighed down by his own kibble. He never looked as cool as Derek Yaniger's art in the Marvel Generation 2 comic, or indeed, his own box art and was easily the weakest of the Decepticon Headmasters. So I sold him. Finally, we have a toy that not only matches up to Yaniger's evocative art, but one that actually trumps Mindwipe and Skullsmasher. 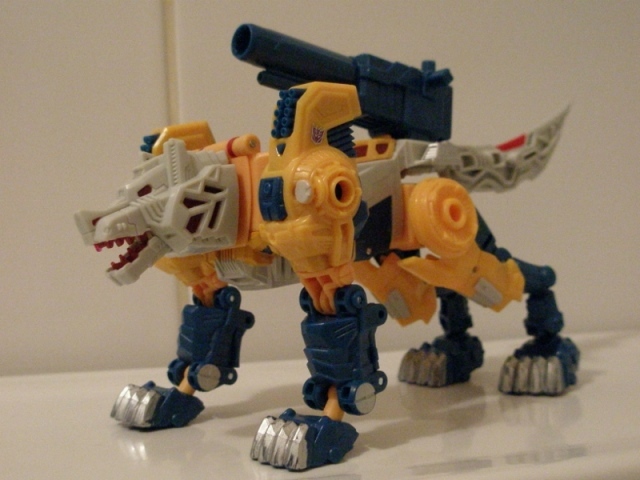 Robot Mode: Wolfwire is a pure nostalgiagasm in his bipedal form, finally capturing the promise of his '87 box art. He's sublimely detailed and some excellent texture that makes him feel really great to pick up and play with and pose. There's this excellent mix of chiselled blocky limbs and round bits, with all these vents and hoses going on. Its not necessary, but really adds to the dynamism of the guy. The bright yellow/ grey/ teal mix still isn't that great, truth be told. The light grey looks particularly anaemic but I'm used to it by this stage, I'm hard pressed to think what would look better. 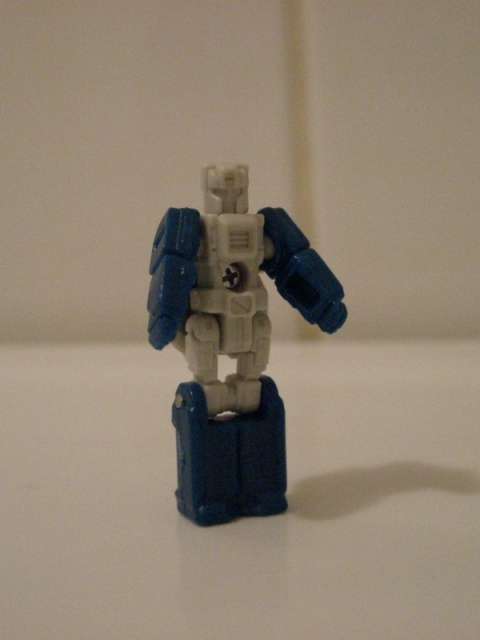 The head is also excellent and one of the better efforts the Titans Return line has given us. Monxo himself could have used a few splodges of paint, but if it meant Hasbro couldn't paint up Wolfwire's face, then I'll do without. 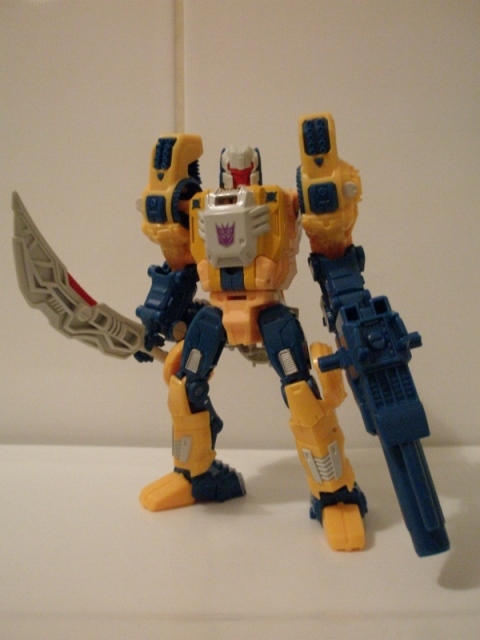 The weapons do feel a bit big for the guy, which is something of an inversion of the original's piddly sticks of plastic, and they make more sense to me in the alt mode, but damn does he look cool wielding these things. Speaking of holding things, the hands are great too, opting for the open palm look, rather than the box with a hole thumper, which suit Wolfwire's elegant look perfectly. Alternate Mode: After years of Generations doing nothing but tanks, jets and cars, its so refreshing to see some actual proper robotic beast modes again. This thing makes me more happy than any 5� wedge of plastic has any right to. He just looks awesome and ready to pounce out of the undergrowth. The feet look a bit chunky, but they mean he's got some good balance, so I don't mind. The silver paint on the toes is a bit thin and the plastic underneath is visible, but I kind of like how this makes them look a bit weathered. Chunky limbs aside, he still manages too look quite lean and fearsome in beast mode, helped by a rather good head sculpt � with opening jaws! This does reveal some rather horrible blood red teeth. Gum disease is clearly a thing on Cybertron as well. Moving along to his back, there's a neat cockpit for Monxo to sit in, or he can man the enormo-cannon on Wolfwire's back. The big sword also makes for a nice bushy tail. Good times.